If you are unsure about using articles you should check your writing when you finish: look at each noun, think about what type it is and the context, and whether an article is required – or not. See also the larger photocopiable version of this table use-of-articles-in-english. It sounds more like English. 3.1.3 As you can see from the table above, if the noun is singular and countable there must be an article before it. If the context is general, you can use a or an. We use an before a noun that begins with a vowel sound, e.g. In both sentences the context is general – we don’t know anything about the book or the egg. It is the first time they are mentioned = first mention. In the following sentence, because we now know about the two nouns (book and egg), the context becomes specific and we use the. C: This is the book I need. C: This is the egg I need. If a countable noun is plural and the context is general or it is first mention, we don’t use an article. This is called “zero article” – when there is no article, e.g. E: The books in this library are really old. Proper nouns are words which always start with a capital letter, like the names of people (“Eric Harrison”), cities (“Birmingham”), countries (“Mexico”), companies (“McDonalds”), products (“Coke Zero”), days (“Monday”), months (“December”), etc. We do not usually put an article before a proper noun. Exception 2: We use the definite article with plural place names, e.g. the Bahamas. If you are still not sure which article to use with each noun in your text, use this flow chart use-of-articles-in-english-flow-chart. Use a because there is more than one house in Bristol! Use the because the swimming pool has got one specific phone number. Use the because in this context music is specific – the music in that place. I went to the new cinema on Leyland Street last night. It is a specific cinema – not just any cinema. We cannot say “…a cinema on Leyland Street” because it is very unlikely for there to be more than one! Let’s switch on the TV and watch Coronation Street. The person or people I am talking to know about the TV and can probably see it because we are all in the same room. I would like spaghetti. > I would like some spaghetti. Would you like any spaghetti? / No, I wouldn’t like any spaghetti. This is a book. > This is my book. This is a my book. / This is her the book. I want a book. > I want this book. I want this a book. / I want these the books. See also this information regarding articles and how to use them: understanding-articles-in-english. Ex. 3.1.1 Writing Which indefinite article should we write in front of the following words – ‘a’ or ‘an’? 1. – Do you like a)_______________ Copenhagen? 2. I read a)_______________ good book last week. 3. a)_______________ Sarah works at b)_______________ bank. d)_______________ eighty-minute commute each way. 5. I went to a)_______________ swimming pool yesterday. assistant said that he would be OK.
6. – I can meet you tomorrow. – Have you got a)_______________ time? b)_______________ manager will be angry with you. d)_______________ friend to give me a wake-up call at six o’clock. 8. – I bought a)_______________ blue guitar on Wednesday. – The one I saw? Super! Can you play it? c)_______________ old guy called d)_______________ Barry. 9.- Have you seen a)_______________ old jumper anywhere? – Is it b)_______________ one with the blue collar? – Yes, and it’s got c)_______________ orange stripes. – It’s over there, under d)_______________ pile of cushions. who works at d)_______________ same firm as my uncle. b)_______________ nice cup of tea. biccies in the cupboard! What shall we drink to? d)_______________ doctor told me that I had to rest. b)_______________ new coffee house in Market Street? you buy d)_______________ latte, you get two free mini doughnuts. to be c)_______________ greatest writer of the Middle Ages. 16.- Is there a)_______________ free table anywhere in this café? – Yes, look – b)_______________ table by the window is available. Oh – hang on – c)_______________ old feller’s just sat down. – Just our d)_______________ luck! Ex. 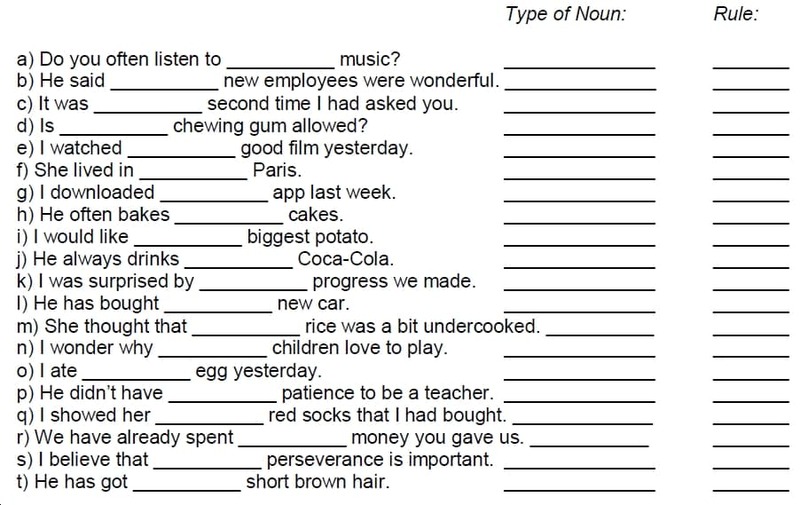 3.1.3 Reading Print this worksheet – entitled ‘Noun Categories’ – and follow the instructions: noun-categories. 1.He was born in __________ August. 2.John sells __________ bikes every day. 3.Do you want __________ spaghetti today? 4.It was __________ hottest day ever! 6.I put __________ unopened letters over there. 7.Is __________ clock slow, or is it me? 8.Would you like __________ apricot? 9.We were moved by __________ kindness that he showed. 10.I got __________ puppy yesterday. 11.We’ve booked __________ taxi for you. 12.Do you believe in __________ justice for everybody? 13.Please would you put __________ rubbish out? 14.What about __________ beef for dinner? 15.Is __________ milk semi-skimmed or skimmed? 16.It seems that __________ mobiles are getting bigger rather than smaller! 17.Do you fancy __________ omelette? 18.Has __________ power come back on yet? 19.I didn’t know that __________ dictionary belonged to you. 20.Have you eaten __________ chocolate from Grandma? 21.Both of us took __________ umbrella just in case. 22.We’ll ask her for __________ information tomorrow. 23.There were __________ toys everywhere! 24.It’s so important that you tell me __________ truth about them. 25.These are __________ channels that I watch most often. 26.He lived on __________ Porter Road when I used to know him. 27.Surprisingly, __________ unemployment had fallen again. 28.I need __________ new kettle, because this one is broken. 29.Can you bring me all __________ empty coffee cups, please? 30.You are __________ first person I have truly loved! 31.We’ll be upset if he gets __________ infection. 32.Be careful! It’s made of __________ glass. 33.How essential is __________ quality to you? 34.You need to replace __________ printer paper. 35.We start to develop __________ teeth when only a few months old. 36.She found __________ pen outside. 37.I don’t like __________ peanut butter. 38.He was pleased with __________ poetry that he had written. 39.I told them about __________ Amanda. 40.Our swimming costumes were dry, but __________ children’s weren’t. 8. ____________ groceries. She needed to get 9. ____________ chocolate cake and 10. ____________ candles for 11. ____________ birthday party on 12. ____________ Monday. On the way home she had 13. ____________ idea and phoned 14. ____________ friend. 15. ____________ Mandy is 16. ____________ florist who works near 17. ____________ health centre. 18. ____________ Ellen asked 19. ____________ Mandy to order 20. ____________ flowers. A. We use a or an because the noun is singular, countable, and in a general context. It is first mention. B. We use the because the noun is used again – after first mention. We are already familiar with it. C. We use the because it is logical that there is only one of these nouns, so it is something specific. D. We use the because the noun is something specific or something familiar to us. E. We do not use an article (zero article) because the noun is a proper noun. F. We do not use an article (zero article) because the noun is plural or uncountable and in a general context. G. We use a possessive adjective (e.g. my / her) because it is clear that the noun is something that belongs to somebody or is closely connected with them.